(Phys.org)—In 1604, a new star appeared in the night sky that was much brighter than Jupiter and dimmed over several weeks. This event was witnessed by sky watchers including the famous astronomer Johannes Kepler. 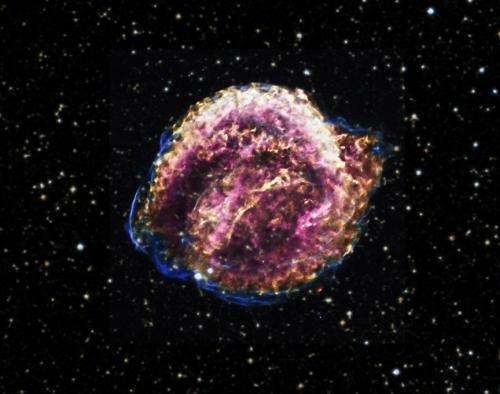 Centuries later, the debris from this exploded star is known as the Kepler supernova remnant. This image shows the Chandra data derived from more than 8 days worth of observing time. The X-rays are shown in five colors from lower to higher energies: red, yellow, green, blue, and purple. These various X-ray slices were then combined with an optical image from the Digitized Sky Survey, showing stars in the field. 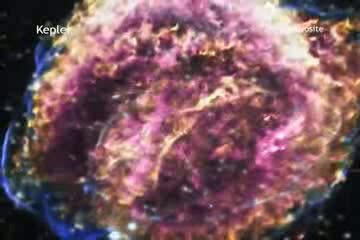 In either model, the X-ray spectrum - that is, the amount of X-rays produced at different energies – reveals the presence of a large amount of iron, and indicates an explosion more energetic than the average Type Ia supernova. Additionally, to explain the observed X-ray spectrum in this model, a small cavity must have been cleared out around the star before it exploded. Such a cavity, which would have a diameter less than a tenth that of the remnant's current size, might have been produced by a fast, dense outflow from the surface of the white dwarf before it exploded, as predicted by some models of Type Ia supernovas. More information: These results were published in the September 1st, 2012 edition of The Astrophysical Journal.